Each year, Casa Hogar Juan Pablo II is very fortunate to receive a large shipment of powdered milk which is donated thanks to the tremendous efforts made by our faithful friends in the Diocese of La Crosse, Wisconsin. Through the years the Diocese has shipped nearly 450 tons of milk to Peru. In recent years Grassland Dairy ® has teamed with Project Milk to process the milk. This donation not only permits our children to drink milk 365 days of the year, it also allows Casa Hogar to be a distribution center to others in need. Every year, we are able to provide several soup kitchens, many other orphanages, and individual social cases with powdered milk. Project Milk was started in 1984 by the Rural Life committee. The connection came from Fr. Joe Walijewski, founder of Casa Hogar. While he was living in the outskirts of Lima, Peru he saw thousands of people suffering from malnutrition. He used to tell the story of meeting a young boy by his house. It was lunchtime and the little boy was outside playing soccer by himself. Fr. Joe asked him why he didn’t go home to eat lunch and he responded, “It’s not my day to eat.” Hundreds of families in Peru are struggling to put food on the table and for some that means rotating days for which children can eat. Project milk has assisted thousands of people by providing them with the essential nutrients for a healthy body. It is especially important for growing children. Thanks to the generous donations of food that we receive from an organization in Canada, we are able to deliver food to other orphanages and soup kitchens. This has helped us greatly to build a strong relationship with the other child-care facilities in the area. When we receive shipments of milk through Project Milk we are also able to deliver some to those in need within our community. Donations that we receive help our kids as well as others in our community. Casa Hogar has a full-time social worker on staff who is responsible for identifying children in need of coming to Casa Hogar as well as constant follow-up on their family situation. She also receives many social cases from nearby. People of all ages and difficult situations come to Casa Hogar and find counseling as well as assistance with clothing, furniture, medicine and food. Since the implementation of the Boys Town Program, the behavior and attitude of our children, as well as and the professionalism of our staff, have earned a positive reputation for Casa Hogar. Many in the surrounding communities, as well as other childcare institutions in Peru, have expressed learning more about the Program. We have “loosely” started parenting classes, once again using the Boys Town Common Sense Parenting materials. The need and demand are high and we look forward to establishing this service outreach further. Another way we are starting to spread the success of Casa Hogar is through the Association of Orphanages in the Lima area that has recently been started. Several orphanages from the area meet with Casa Hogar once a month to discuss ways to help with things like food costs, activities for the orphanages and donations. Apart from the powdered milk we are able to share with the orphanages, we collaborate with them to get donations from local businesses. Family Preservation is another aspect of the Boys Town Program that we will be introducing soon. This program works with the biological family before it breaks up, identifying each individual’s strengths and teaching them how to keep the family intact and working. In an effort to bring help to people in need outside the doors of Casa Hogar, we have hosted 10 international surgical medical missions that have impacted the lives of hundreds of people since 2001. These missions have included opthamologists, students of optometry, an ocularist, dentists, plastic surgeons, pediatricians, anesthetists, nurses and many volunteers. As mentioned above, we host an eye clinic right here at Casa Hogar every other year. A group of volunteer optometrists and assistants come to Casa Hogar to provide free eye exams to those who could otherwise never afford eye care. Thanks to the hard work of everyone at the Lions Club, we receive thousands of pre-labeled glasses that we can then give to the patients the same day. The eye clinic is hosted right at Casa Hogar, so everyone teams together to lend a hand. Each mission we are able to care for thousands of patients. For many, this is the first pair of glasses that they have ever received. In 2000, Casa Hogar received a generous donation of two dental chairs and equipment for a small dental clinic. 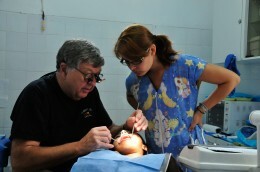 Since then, with the help of volunteer dentists, we have been providing dental work for our children and staff. This has also been the site of four international dental missions.